This is a size #1 thread, similar to regular sewing machine thread. 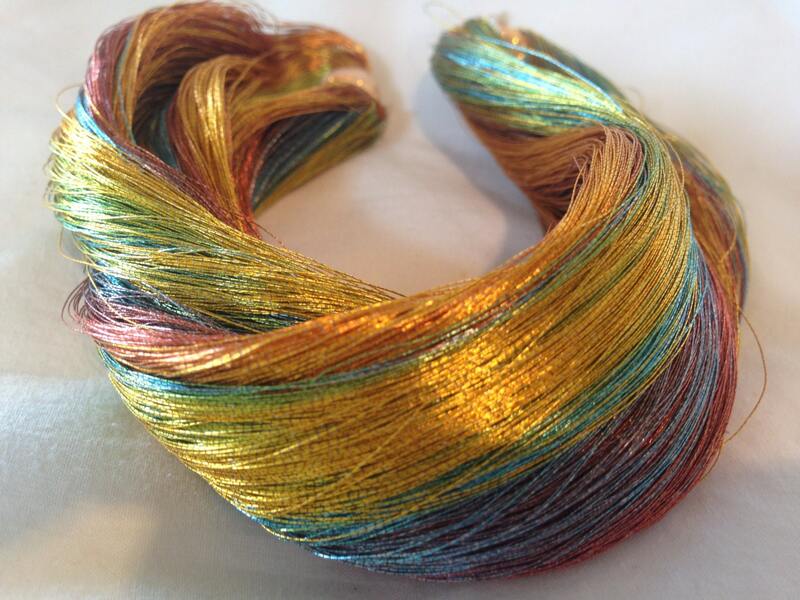 ..This gorgeous silk thread is wrapped in 24k gold then dyed in brilliant rainbow colors. The technique is called Bokashi, which means that color is graduated. In wood block prints, the color will start out darkest at the top then gradually become lighter and is generally used on skies. I've never seen the term applied to thread but that's what our Japanese picker told us it was called. The colors cover most of the spectrum and the individual threads do transition from dark to light. The colors are so vivid that they will glow and make any piece they're used in a true show stopper. We've never seen this thread before and with all of our threads, they are rare and it is uncertain that more will be found. Personally, I love this thread.